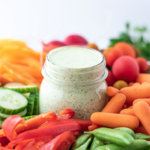 A Whole30 approved green goddess dressing full of fresh herbs, with a perfectly tangy taste and creamy texture. Serve as a healthy dip or dress your favorite salad. Add all ingredients to a food processor, or blender. Pulse a couple of times to break it all down, then blend until well combined. Taste the dressing and adjust salt and pepper as needed.